Welcome to another 3 part series on Oregon’s economy. 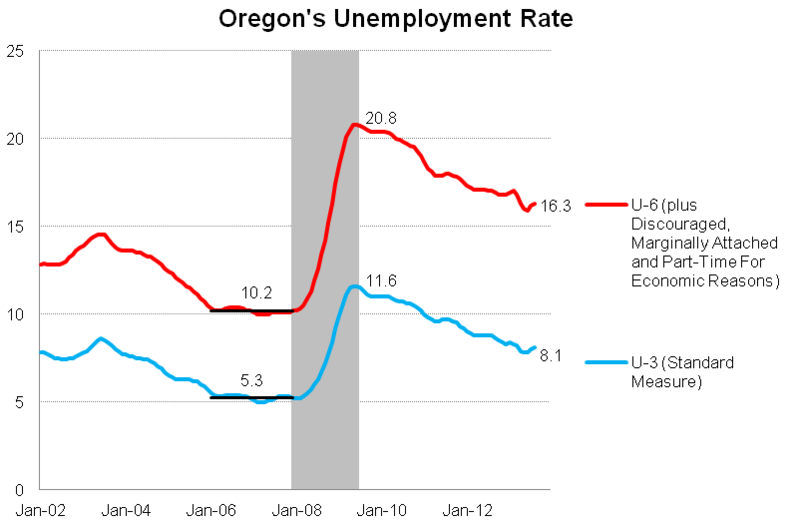 Today in Part 1 I will provide a brief overview of unemployment in Oregon, at least by the numbers. 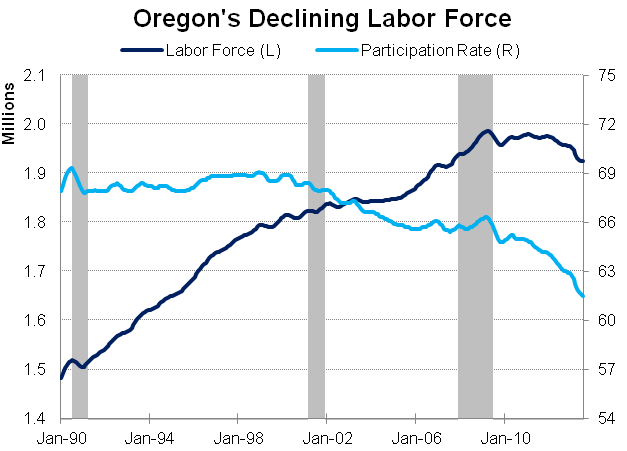 Part 2 will get wonky and technical by examining Oregon’s Beveridge Curve; particularly the divergence in labor markets for the short-term and the long-term unemployed. Part 3 will discuss job prospects and what happens to the unemployed. While the labor market is slowly improving, it still has quite a long way to go before approaching pre-recession levels. Today, the standard unemployment rate stands at 8.1 percent which is down 3.5 percentage points from the depths of the recession however remains nearly 3 percentage points above the 2006-2007 average. Given that the standard measure of unemployment counts all individuals with a job as employed, whether part-time or full-time and only counts those as unemployed if they had looked for work in the past few weeks, some tend to focus on the so-called U-6 measure of unemployment. This measure also counts those who have given up looking for work as unemployed and those who would like to work full-time but are not due to poor economic conditions. Oregon’s U-6 rate has followed the same general pattern over the Great Recession: it has make sizable, if slow, improvement in the past few years but remains significantly elevated relative to 2006 or 2007. 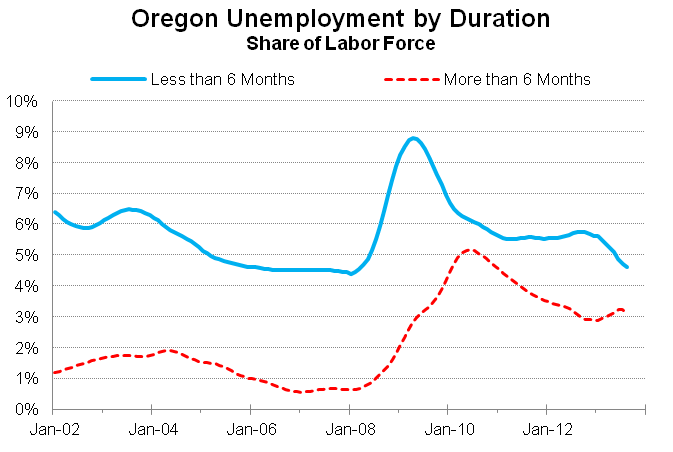 While the above examines unemployment rates, it is also important to keep in mind the actual number of unemployed Oregonians and to distinguish between the short-term and long-term unemployed (this will be especially useful in tomorrow’s post). The commonly used definition is if you have been unemployed more than 6 months, you are considered long-term unemployed. 6 months, or 26 weeks, is also the length of duration for the regular unemployment insurance program in terms of receiving UI benefits if you qualify. 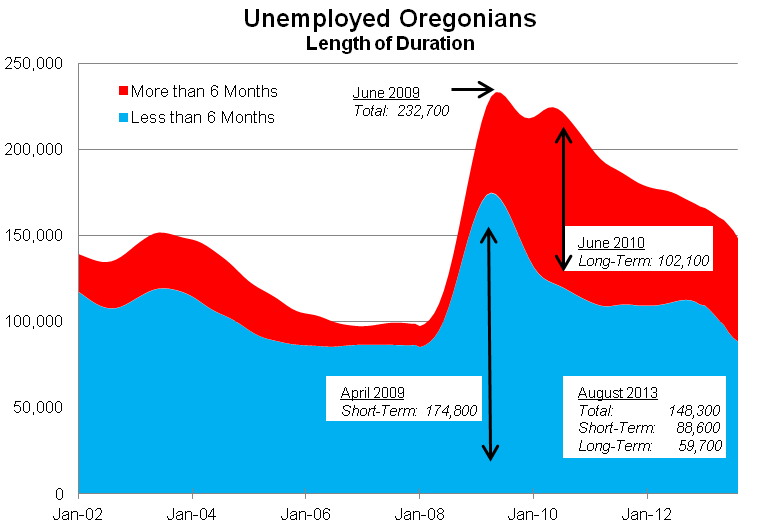 Today, while the number of unemployed are falling, there are clearly still too many Oregonians without work. In August the unemployed numbered a bit more than 148,000 with about 40% of these individuals being out of work for more than 6 months. 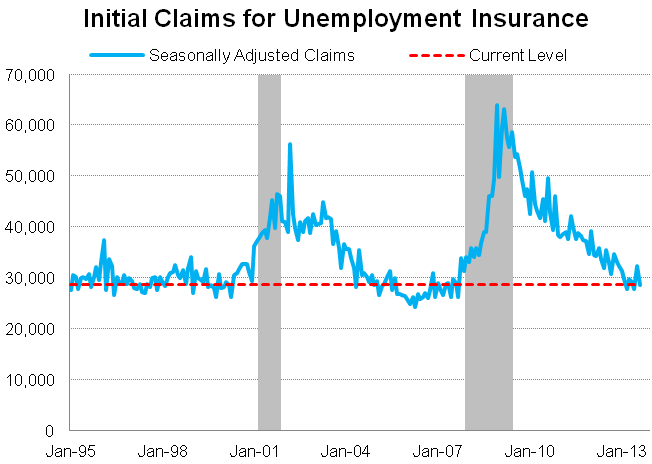 The good news is that initial claims for unemployment insurance are back down to pre-recession levels and those seen back in the 1990s. This means that layoffs in Oregon are currently low so there are fewer and fewer recently unemployed Oregonians and if you have a job, the probability of keeping your job is higher than it has been in a number of years. The bad news is that while layoffs are down, the rate of hiring still remains weak. Yes, job growth has picked up in the past year however from a historical point of view, it is still lackluster. Unfortunately our office’s baseline outlook is for just a bit more improvement over the next year or two. The worse news for the economy is that the labor force is falling in both the number of people in it and the participation rate among the overall population. This is not good as the Oregon economy has historically benefited from an influx of young migrants, typically college educated, and a higher labor force participation rate. While the participation rate decline is a nationwide issue (see the Employment Department’s report for more) it may act as a drag on future growth, if less of the population is gainfully employed and producing economic activity, growth will be slower. 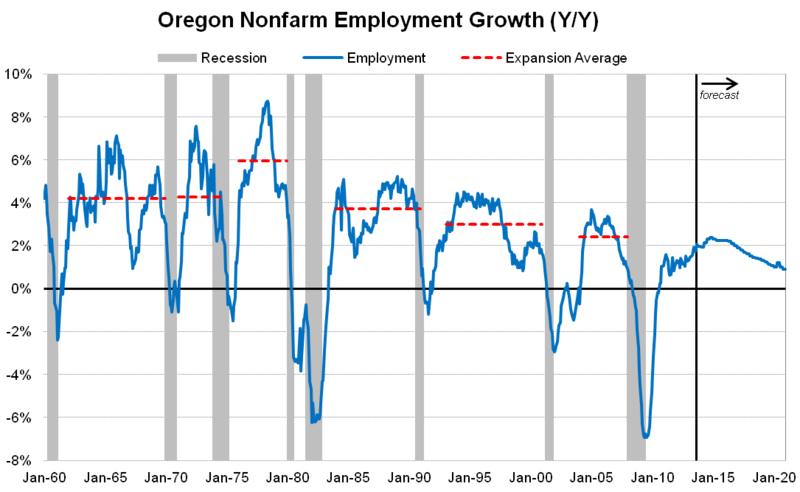 The other factor with a falling labor force is it may mask the underlying labor market problems, as measured by the unemployment rate alone. The unemployment rate has both a numerator and a denominator so it can rise for good reasons (more people looking for work) or decline for bad reasons (more people giving up looking for work). If the drop in the number of unemployed is coupled with a drop in the labor force, the unemployment rate will decline even though the level of employment relative to the population is steady. Unfortunately this does appear to be the case in the past year or two as employment growth has been just fast enough to keep up with population growth, resulting in an effectively steady employment to population ratio, even as the unemployment rate falls. The end result of all of these trends is that we are seeing a return to more normal levels of short-term unemployed in the economy (weak job growth plus low levels of layoffs), but the share of long-term unemployed remains significantly higher than pre-recession levels (growth has not been strong enough to make a significant dent in these numbers). Note: one adds together these two lines to arrive at the standard, overall unemployment rate. This narrative, the differences between the short-term and long-term unemployed, has been the subject of a hot debate among economists and researchers in recent years. The next two parts of the series will focus on this bifurcated nature of the recovery and also job prospects for the short-term and long-term unemployed.